(Scroll down to see Policy ! Always check your booking for date and number of seats on your confirmation.. Tip:If you have problems booking and did not get a confirmation please contact us... "How to book"
*Non online booking will be $109.99 So get your seats today, and don't forget you can always cancel a week before your sailing date if you need to, no cost. Lunch trip, 10am-1pm or 4:00pm-7:00pm(Mar-Sept) 3:30pm-6:30pm (Oct -Mar) see rates below. Regular Price: $109.99 per person. Book ahead and get Online-booking discount $ 109.99 $89.99 *p.p!! Includes everything!! Sailing. 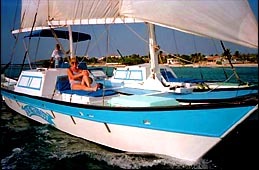 Drinks, Snorkeling/gear, our award winning food, Sunset sailing on the way back, Complimentary Video. See what is open; click on "Book Now"
DON'T WAIT, we are ALWAYS booked! AM trips(Private Only) 10am 1pm. $399.99* per Hour AM Trips. For more info on Private sailing click on Picture. 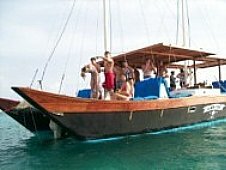 ***Open Bar/Sailing/Snorkeling+equipment/Fun/Great Food(see comments) and best of all... No Crowds! 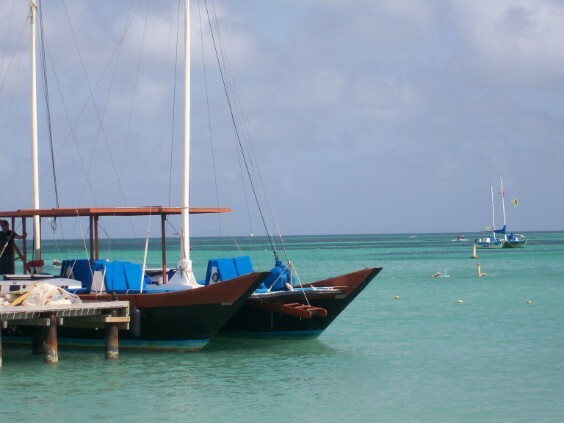 We sail from the dock at the Aruba Marriott Surf-club, be there 10 Minutes before the trip and bring towel, sunblock, bathing suit, camera and we take care of everything else. Includes every thing!! Sailing. Drinks, Snorkeling/gear, our award winning food, Sunset sailing on the way back, Complimentary Video. and best of all... No crowds! -If you still have any questions; e-mail bluemelodysailing@hotmail.com(*Discounts for online booking only, no moneyback on discount bookings, however,if we get to fill up the seats we do give a refund. *If it is raining (rare) we wait to see if it stops, if at the time of the trip it still rains and it looks like it is not stopping we refund as well. *however *every passenger must come to the dock, more often then not we get to sail anyway, we always check the weather online through a number of sites for this. 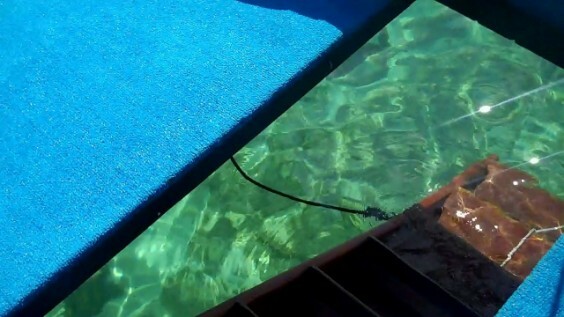 ***/Open Bar/Snorkeling equipment/Fun/our great food( see comments) and best of all... No crowds! 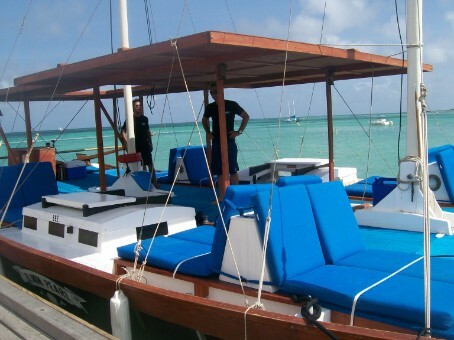 We sail from the dock at the Aruba Marriott Surf-club, be there 15 Minutes before the trip and bring towel, sunblock, bathing suit, camera and we take care of everything else..
1. Find the week, then day and date. Click on it. Note. It works on any hand held device, just make sure to grab and drag window up and to the left to see the hole picture. 3. Then click on New Booking. 5. Fill out the next form. Click on "submit booking"
Note. It works on any hand held device, just make sure to grab and drag window up and to the left to see the whole picture. ( Seats on The Black Pearl +20 passengers. Note; the Blue Melody is not sailing this month. 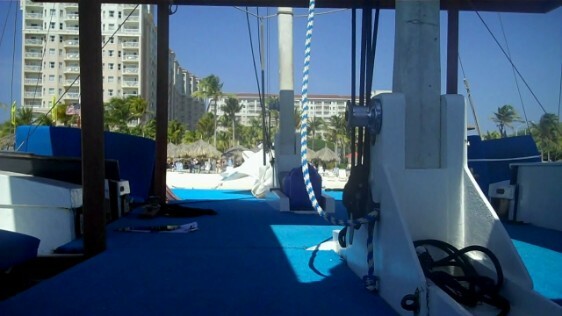 -If you still have any questions; e-mail bluemelodysailing@hotmail.com We have a 100% Satisfaction guarantee !! (*Discounts for online booking only, no money back on discount bookings, however,if we get to fill up the seats we do give a refund. *If it is raining (rare) we wait to see if it stops, if at the time of the trip it still rains and it looks like it is not stopping we refund as well. *however *every passenger must come to the dock, more often then not we get to sail anyway, I always check the weather online through a number of sites for this. Rainy days you need to show up at the dock at the time of your scheduled trip for refund or change day of sailing trip...!! NOTE: There is a full charge for NO SHOWS and any cancellation after 9:00am on the Sunday of the week you are schedule. Inform us in any event so we can fill the seats of the day you are schedule, if we can then you will be refunded. Always check your booking for date and number of seats. If you did not get a confirmation you may still have made a booking, let us know if you did not get a confirmation to avoid being charged for seats you did not use. Please note:There is a $25 charge for every wrong full credit card dispute. For groups please note that the you can only use the Card the booking was created with. Note: Always ask your insurance provider to make a cancellation insurance for your travels.